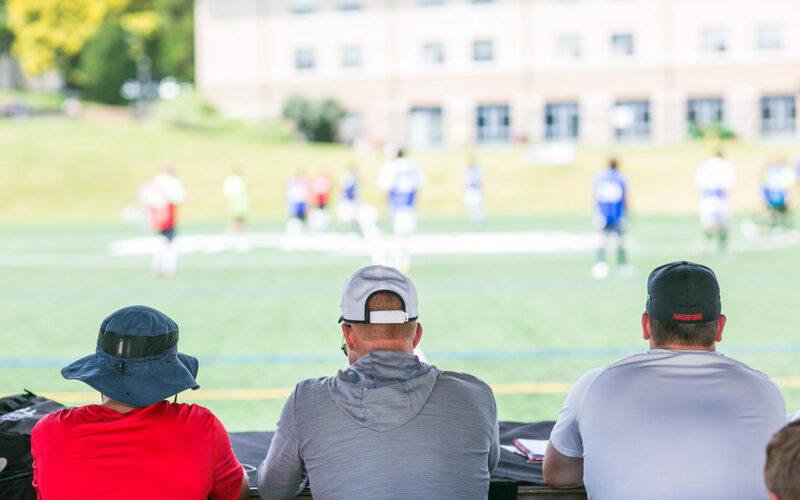 Although there are many different ways to maximize your soccer recruiting chances, such as playing in front of 75 coaches at Future 500 ID Camps, one of the most important ways is by doing well in the classroom. Let’s say, hypothetically, that you have a strong GPA, perfect SAT, and perfect ACT. With these scores you will be accepted as a student at virtually every college/university in the United States. Now let’s say that you’re at the other end of the spectrum and you have a 1.1 GPA and a 400 SAT. It is a safe bet there will not be many schools that will accept you as a student. Although not many schools have the strict academic requirements of Harvard, Stanford and Yale, every college has some academic standard of acceptance. Unfortunately, a 1.1 GPA and bottom-of-the-barrel test scores will not get you accepted anywhere for NCAA college soccer. Now, most of you are probably somewhere in between those two extremes, but you get the point. The better you do academically, the more schools that will be available for you to consider when trying to find your school for college soccer. Not doing well academically will automatically limit the number of schools that you can look at. The last thing that you want is to be recruited by a college coach, visit campus and fall in love with the school, only to discover that your grades and test scores are not high enough to be admitted. Grades determine the size of your viable pool of colleges. We often hear the following sentiment from high school students that do not prioritize academics: “I’m not a good student, but grades and test scores don’t matter as long as I’m a great athlete. The coach will want me.” Yes, if you are a great athlete/player the coach will probably want you, but the university won’t and that is a massive problem. Believe it or not, it is the college that has the final say on whether or not you will be accepted, not the college coach. Now, depending on the school, division, and sport, a college coach may be able to influence the admissions process in an NCAA-legal way. At certain schools, coaches may be able to get their top recruits admitted regardless of academic standing. At other schools, coaches might only be able to get recruits admitted if they are close to meeting the general academic standards. At many schools, however, coaches aren’t able to intervene in the admissions process at all. At the end of the day, counting on a coach to “get you in” will limit your opportunities and leave you unable to be involved in college sport at the schools of your choice. Academic achievement is often the deciding factor in whether or not a coach will begin the recruiting process with a player. For example, if the Harvard Men’s Soccer Coach receives an email from a local player with a 1100 SAT, do you think that the coach will take time to go see him play? Not likely. As we’ve mentioned before, college coaches are human and have a limited amount of time, attention, and energy. The Harvard Coach knows that even if the player is a great fit on a soccer basis, he will not be accepted based on his scores. Instead of wasting his time, the Harvard coach will focus on other interested players that meet Harvard’s academic standards. Most coaches use academics as a filter to help determine if they will begin to seriously recruit a prospective student-athlete. This helps them to quickly focus their recruiting pool by eliminating the players that will not be admissible at the end of the process. Academics also matter once you have been successfully recruited to play college sport. If you have received a scholarship you will most likely have to maintain some base level grade score in order to maintain your scholarship and your place in the team. Developing good habits prior to college will only serve to strengthen your college soccer experience. Working on obtaining good grades and developing your game is important. Once you have this solid base and are starting to engage with the college soccer recruiting process it is important to create exposure for yourself by playing games and training in front of college coaches. Future 500 provides the most valuable platform for this college exposure by bringing in 75 college coaches to each camp. These coaches consist of D1, D2 and D3 coaches making for the highest quantity and quality mix of coaches for players of all ability. Learn more about the 5 steps that Future 500 uses to contribute toward your college soccer journey here.